Nearly 60 years later a small contingent of Te Papa staff made their way over the Rimutaka mountains in a truck and car, carrying 148 items identified as the Masterton Museum collection. We were met by Aratoi staff, Rangitane and Kahungunu who warmly welcomed us, and the collection, back to the Wairarapa. The collection is wide in its composition and reflects the kind of collecting typical of the late nineteenth century. The collection consists of taonga Māori; items collected in Australia, the Pacific, Africa, Egypt, and Asia; natural history specimens (including two Huia and a number of Moa bones), as well as items with a national historical significance and those closer to home with strong Masterton or Wairarapa connections. 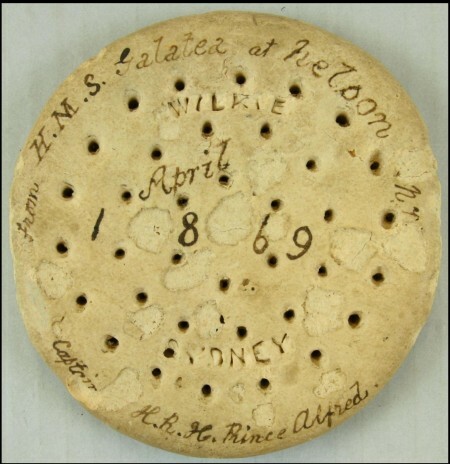 One of the more fascinating items is a circular ship’s biscuit made by G Wilkie & Co. Sydney. Ship’s biscuit, also known as hardtack, was a staple of a sailor’s diet. It was usually made of flour, water and salt and double or triple baked to ensure it lasted on long voyages. Sailor’s often had to soak the biscuit in liquid before they could consume it. There are other fascinating items in the collection and Aratoi are planning to include them in an exhibition later on in the year. Wait until you see the cow hairballs or a drinking bowl that once belonged to the Hawaiian King Kalakawa (1836-1891). How about a hue (gourd) reputedly taken in a raid at Parihaka in 1881 or a Crypto Bantum safety bicycle used in Masterton in 1903 by Mr Howarth? It is really warming to know that we were able to honour our 1954 agreement and see the collection return home. will do thanks, wish I had known! I am at Clareville its a 10 minute drive up to Aratoi!!! What is the chance to actually view this biscuit please? and what other items from Masterton? I have spoken to friends about this biscuit, they all find it so interesting, even Masterton Archives… There was a BOYES in Masterton in the early days, also one with the other spelling, Boys. Surprised no follow ups! One could say, that takes the biscuit! Love this article. Prince Alfred, I knew visited New Zealand in 1869, as when I was researching Royal Hotel in Featherston, it has a coat of arms on it, and to have this on a building in the Southern Hemisphere is remarkable, and normally permission from London would have to have been granted to display it, only other hotel in NZ with the Coat of Arms, is the Royal at Naseby.. Perhaps Mrs Boyes took the biscuit for a souvenir, bet she never realised here in 2012 it would hit the news.. Has anyone thought of contacting Windsor Castle Archives about this actual biscuit, no doubt they would find it very interesting.. how is the biscuit stored? Love to know who Mrs Boyes was!